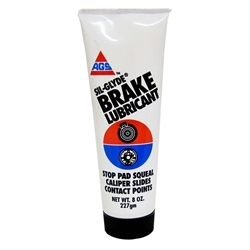 Sil-Glyde Brake Lubricant BOWES CH BK-8 8oz tube. Sil-Glyde® is a silicone based brake lubricant recommended for the entire brake assembly and is compatible with rubber. It is a moisture-proof and heat resistant to over 425 degrees F (218 degrees C), which means it won't burn-off like other brake noise products. Using AGS brake lubricant is one of the keys to eliminating disc brake squeal.